The 16" Planter stand is a Minimalist, modern way to showcase and add a little height to your greenery. The planter stand is made of powder coated steel and perfectly houses our own 16" Spun Planters. Suitable to use indoor and outdoors. Available in colors black, peach, and pale gray. 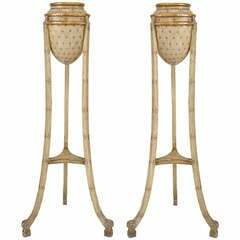 Materials Steel Dimensions: 9.5" W x 14" H.
Pair of Weller Clinton ivory Art Nouveau planters on Stand with rosebud design.